It was a slow start to the experiment. By the time we got done with some errands, including grocery shopping for the impressive array of produce, it was basically Sunday evening. We excitedly got home and picked our “meal”, which I decided should have beets in it. My husband hates beets. Now, I didn’t pick beets because I was being cruel, but because my husband kept saying that he was hopeful that this was a way he could finally consume those veggies that are really good for you, but that he can’t stomach–even delicately steamed and deliciously prepared by his talented wife. So I chose something with beets. The recipe called for one beet, four carrots, two cups kale, one cup spinach, two apples and a thumb of ginger. It was interesting. The color was beautiful but the smell was very green. Surprisingly, the flavor was nice. The ginger was key here and I don’t know if we would have had as positive of a start without it. Unlike a fine wine, you don’t want to inhale too much. We “ate” early, like around 5:00 pm, which meant we had aaaaaalllllll night to think about how unsatisfied we were. I ended up eating two bananas. Hey, Joe from Fat, Sick, and Nearly Dead ate fruit, too, so it’s okay. I also drank several cups of tea. My husband had some crackers with peanut butter and a banana. I noticed I burped a lot. By 11:00 pm I was starving and more than ready to go to bed. I was thinking about food, a lot. Monday was the first full day of juicing. I was nervous. Just look at how much I bitched about measly six hours the night before. But I did not wake up particularly hungry, which I thought was a good sign. I persevered and stuck with my juice… and fruit. I had a banana after breakfast and an apple after dinner. I also had a “snack” juice and a “dessert” juice, which is recommended from the rebooting program. I was proud of myself. Food stared me in the face all day. Particularly this one can of soup. I just imagined it being all nice and warm and chunky. I really liked looking at it, almost so I could have a goal to work towards, thinking, “I get to eat this when this is all over,” Which was nuts because I wouldn’t normally eat canned soup, and it certainly wouldn’t be the thing I would want to eat above all else. But for whatever reason it called to me. Below are a couple of samples of our “meals, ” which were then reduced to less than two pint glasses each time. By 10:00 pm on Monday I was starving! My stomach was rumbling and had been all day. Hunger or digestion? I dunno. I was also a little nauseated. My husband ate various sources of protein throughout the day: eggs, chicken, tuna. I resented him a little. But he was worked out that night, so I gave him some slack. I drank a lot of water but still felt sluggish throughout the day and I was sooo thirsty. I also had a bit of a head ache. Any physical was activity was draining. Basically, all the text book side effects, except the body odor, of course. Tuesday, dawned earlier than anticipated once I realized that I needed to attend a fundraiser breakfast. It was torture. I still made a juice in the morning and counted on eating just fruit at the breakfast. And I figured orange juice was okay. The breakfast went swimmingly. Well…except for the scrambled eggs I ate. But I could only take a little bit of fruit because I was one of the first to pass it around. And eggs are mushy any way. But so good. So good. I still count this a win because I did not eat the Danish, donuts, bacon, and hash browns. I also attended another meeting that afternoon where skittles, milk duds and cookies were passed around. I easily passed those up…but I did grab a diet coke. For some reason this really annoyed my husband who considered the diet coke more egregious that the eggs. Really? My husband and I constantly asked each other how we were feeling. It was like couples therapy. And should I talk about the gross stuff? Well, let me put it this way, don’t be surprised when because you drink a lot of deep, intense color, a lot of deep, intense color comes out. The beets are particularly shocking. On Tuesday evening we went on three mile walk, something we always try and do if the weather is nice. My husband was wiped out after the walk. I felt okay. I think the calorie difference was really starting to affect him. While he was supplementing somewhat with sources of protein, he was still consuming substantially fewer calories. By Wednesday, my husband was ready to tap out. This is where we reveal a secret. He has Crohn’s. He had done a lot of research on whether this was healthy for him. Normally he is not supposed to eat a lot of fiber, but with the juicer, the roughage is left out, so he was excited that this could be a way to get all those nutrients he felt he was missing. But but by Wednesday he was feeling light headed, nauseated, and with an upset stomach. Basically all the signs of a Crohn’s flare-up. Or…the third day of a juice fast. I thought that, perhaps, he was consuming too much citrus because many recipes call for lemons and oranges. He had a bad experience with Mai Tais on our last trip to Maui and the acid content was a big factor. We discussed options and he decided not to risk it. Even the small amount of protein he had been supplementing with was not enough for him. He stated that he would be eating real food, but nothing doctored or processed. No oils or salt or added sugar. He immediately took out two beautiful, plump, perfect chicken breasts to defrost. I put some lemon zest, fresh rosemary and mustard powder and left them to marinade. When I cooked them later that night, my mouth watered a bit. The constant refrain that has gone through my head throughout this whole thing is “maybe just one bite…” And seriously, if my husband had offered, I would have taken him up on it. He didn’t offer. I had an apple, a couple of stalks of celery and a banana through out Wednesday as snacks. Believe me, if it weren’t for the possibility of eating real fruit–crunching on something–I don’t know that I would have gotten through the first part of the week. On Thursday morning, I felt good. Tired, maybe. Excited that this was almost my last day of juicing. Oh–did I forget to mention? This was now officially a 5 (and 1/3) day “reboot.” Life was about to get in the way on Saturday and it would have been impractical to do on Saturday. I received great news that an event I was going to attend Thursday evening was cancelled due to heavy rains and flooding. I mean, it wasn’t great that there was flooding, but that I wasn’t going to be tempted by pizza and whatever else they had planned for dinner. My husband decided that he didn’t need breakfast juice and the thought of going through all that clean up for just one little glass of juice was annoying. I seriously considered just eating an apple. 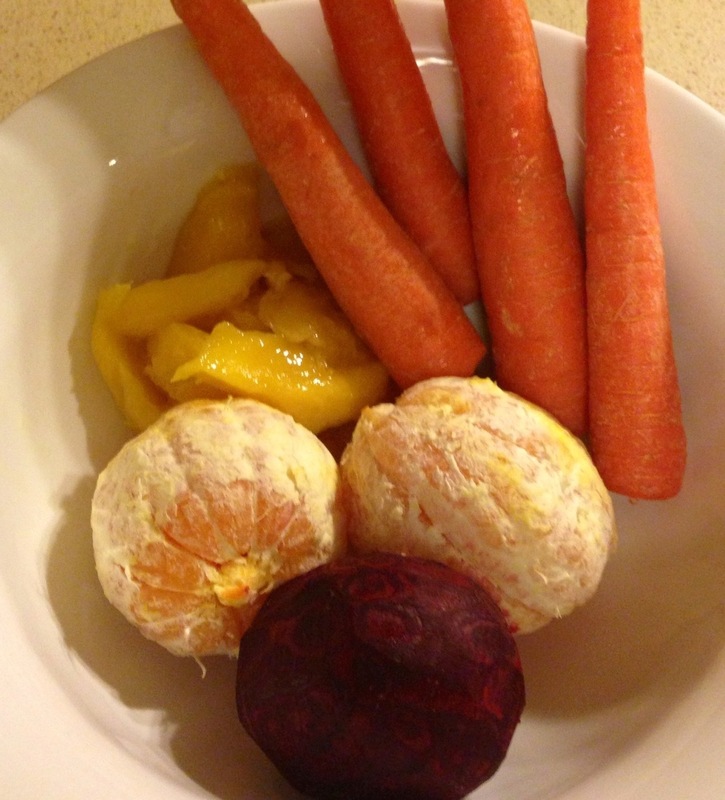 In the end, I decided to go ahead and make juice, since I was blogging about it. This forum is like truth serum and helps keep a person honest. Damn you people. Since it was just me on Thursday morning, I made up my own juice sans recipe, and it was totally delicious. See…my husband should trust me more. I had my breakfast and felt satisfied and fairly alert afterwards. As I was getting ready on Thursday morning, I thought my body looked slimmer. The scale showed that I lost about four pounds. I was still waiting desperately for that skin “glow” people talk about. I don’t know if I will get there in just five days, or maybe I just don’t have glowy skin. 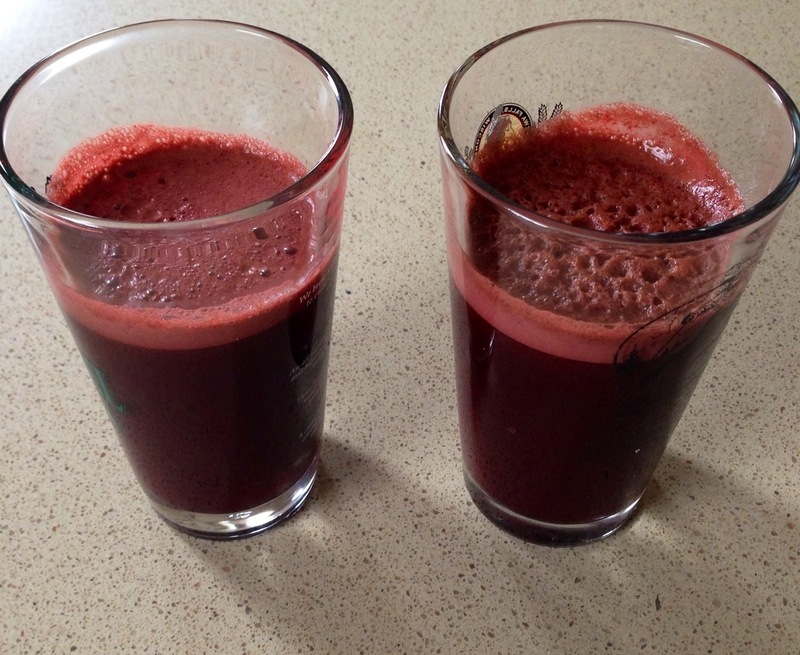 For lunch, I had an extra serving because my husband couldn’t get away…so I had his juice. It was nice and filling, and used my last beet. I really liked the beet-based juices. Not only do beets provide beautiful color, but they provide wonderful sweetness. I bet my husband was not sad to have missed it. After lunch, I didn’t feel tired, but I also did not feel energetic. And I still felt very unsatisfied. I munched on an apple, which helped the littlest bit. I had run out of bananas by then which was really sad. Bananas are filling and sweet. I set out a nice piece of salmon for my husband’s dinner. The juice recipe I was using for myself for dinner called for ginger, lemon, and parsley, among other things. So I juiced those first and poured a little over the fish. I sure would have liked to have tried it. I stuck it in the oven and made the rest of my juice, which had a giant green apple, celery, red leaf lettuce and cucumber in addition to the above. I also threw in the rest of my fennel since it was green, too. The green juices are my least favorite. They make me feel like I am drinking pesto. Usually the green recipes go all green, with cumbersome or celery and kale and spinach and stuff. Unfortunately, when you throw greens in most juices to try and cover them up, it make it a really unattractive puce color. My husband decided not to drink any juice because he felt Crohn-sy. By this point he was pretty much done and finally admitted it. So, instead he ate that luscious piece of salmon on a bed of whole wheat pasta, topped with fresh parsley. I just kept telling myself I only had one more day. One. More. Day. How do people do this for longer ( beach Veg*n I am thinking of you!) ? It’s so boring. Since my husband was not participating in this any more, I decided not to go to the store and stock up on additional fruits and veggies. I felt I had plenty of fruits and veggies I could cobble together to stick it through one more day: two oranges, five red delicious apples, romaine lettuce, a dozen carrots, several stalks of celery, a thumb of ginger, and a lime. Totally do-able. On Friday morning I separated my remaining fruit and veggies into three piles: Breakfast was two apples, one orange, one lime, and four carrots, Lunch was one apple, four carrots, one orange, and Dinner was two apples, one thumb ginger, four carrots, four stalks of celery. My romaine had gone bad so I could not use it. Darn. It was going to be an orange kind of day since the carrots were going to be the base of each of my meals that day…but it sure was pretty. And pretty delicious. The carrot-orange combos are pretty good. Since I only had to make juice for me, I was able to pull about a pint glass of juice from each grouping. I had a a few celery stalks that I saved as a snack since I knew that it would be tough to make it the whole day without having something crunchy. They were total life savers and helped get me through that late afternoon snack attack phase. My husband asked during lunch on Friday afternoon if I was finally feeling that burst of energy I was supposed to feel after the 4th day. I had to think about this. I did not feel tired, but I did not feel full of energy either. I would have to say that I, perhaps, felt more alert than normal, especially in the afternoons. Friday evening was fairly anticlimactic. I had no special juice recipe to celebrate with, and probably the least tasty juice combo of the day. Also, my dinner plans for Saturday were cancelled due to some freak weather issues, so I had no giant bowl of pasta to look forward to. I suppose I could have committed to another two days since my original conflict was gone… but I don’t think a person should be so wishy-washy. Anyhow, the whole thing just kind of fizzled to an end rather unenthusiastically. But my husband was proud of me…and he kept saying so as he ate his normal, delicious curries shrimp dinner. By late evening these are all I had left of that massive pile of produce I had at the beginning. But I was already thinking of all the delicious, firm things I could eat. Midnight counts as Saturday, right? When my husband and I first started talking about this, the testimonials we came across all touted the health benefits about doing a juice fast. And I am not talking about losing weight. I mean, they discussed the energy, the surge of nutrients, the cleansing of your system, the clearing of your skin…the wonders of the universe, basically. I went into this thinking it was a healthy lifestyle choice. But in the end, this total absorption with juicing to the exclusion of healthy balanced meals was just a diet. It really was just a drastic reduction in calories. And I don’t do diets.The entire time I wasn’t really thinking about health or nutrients, I was just thinking about my weight. I had pretty great results for just one week. I lost about an inch on my waist, and about 5 solid pounds. Pretty unbelievable for only 5 (and 1/3) days. If nothing else, that would motivate me. 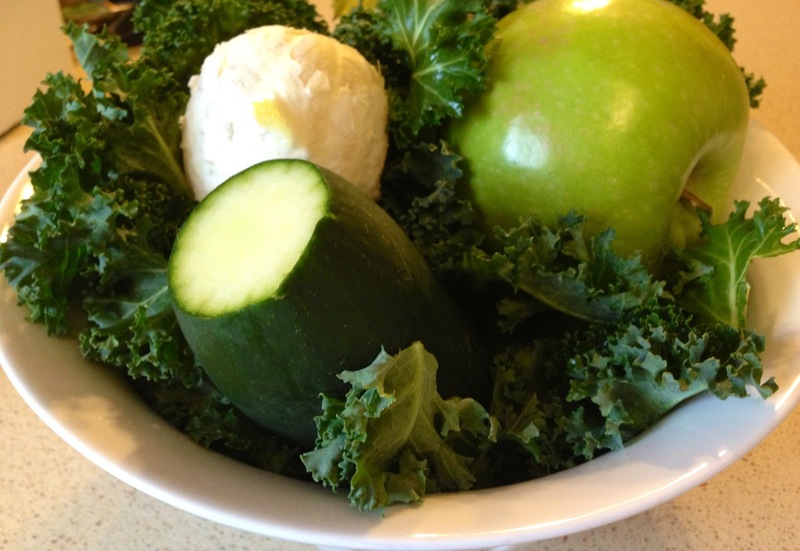 Looking back, I appreciated doing this for a week so that I could get a sense of what I liked about juicing and which combos really appeal to me. And I did get about 3/4 of the picture below inside of me! I may do this again (fast, that is) right before vacation, but probably not just for kicks. It is really inconvenient. You have to be home at all meals. Unless maybe you live in California, there are probably no healthy juice places around you, so you can’t do it while you are at large. Although… my sister did tell me that they have a juicer at her office, which I thought was pretty progressive. But she said that she never used it because the clean up was a hassle. It is. Like, a big one. You are cleaning up all the time. It’s messy and particles splash every where. And like I said before, fasting is boring. And tedious. Plus, for really fresh vegetables, you have to go to the grocery at least twice a week, too. This also produced a lot of pulp by-product, which I did not really deal with because I was feeding it to my worms for compost. We ran every batch through twice to get as much juice as possible out and saved the rest for the little red wrigglers. In the future, I may play around more with that because the daily output of pulp in this reboot was a bit too much for my worms to handle. I’m just hoping to get to it before the smell gets too bad. Maybe I can play them some classical music to motivate them. Also, the pulp is still food, and could be used for a lot of things, which made me feel bad about just tossing it to the worms. There are lots of good ideas like at this the kitchn.com site. But I couldn’t eat anything so I sure the heck wasn’t baking or making pancakes or cheese spreads. It didn’t occur to me to freeze it, though. That is a good idea. However, if you are going to save the pulp for cooking, I suggest you remove seeds and parts that are fibrous or tough. Maybe even peel things like ginger and sweet potatoes. On a good note, since I was using a lot of citrus, I ended up with a ton of zest, which was a nice by-product. Plus I threw all the peels down the disposal, so it smelled very fresh. Overall, the process was interesting, especially being a couple that had never juiced anything before. Don’t get me wrong, I plan to use my juicer a lot, and already have some ideas percolating. I would likely use it as an occasional meal replacement or supplement. But the secret to not going crazy and wanting to binge all the time is by balancing the juicing with real, healthy meals. 1) Do it with a partner. It’s no fun to juice alone. 2) Supplement with whole fruits and veggies. Not having something solid is really psychologically challenging. 3) Adapt recipes to what is in season, on sale, and what you prefer. Skipping all that meat should really save you money, so you should bulk out your juice with whatever is cheap and not blow it in sticking to a certain recipe. 4) Never prepare juice with a white shirt on that you plan to wear to work! Wear an apron. Carrot and Beet juice stain. 5) Choose a time frame where you have nothing going and can be home for most, if not all, meals. Having to attend events where you are the only one not eating is weird and not helpful to your task. Also, spending several dollars on an Odwalla is not my idea of a good deal.